I left Copenhagen Friday morning eager for the next chapter of my trip to start, but with the feeling that I was leaving a special place. There’s a reason Copenhagen always gets high rankings for quality of life. It offers many of the urban amenities that attract people to major cities like New York. The bars are open until 6 am, there are hundreds of restaurants, the fashion industry is booming, and many buildings have tastefully blended old European architecture with modern Scandinavian design elements. Copenhagen also offers the charm and security that I’ve often felt in smaller cities and towns. I saw parents lounging on blankets in public parks adoring their newborn babies. Groups of kids played outside unsupervised. On Sunday everything was closed and the city felt quite and restful. People seemed happy and at ease. It’s a city I hope to spend more time in at some point. 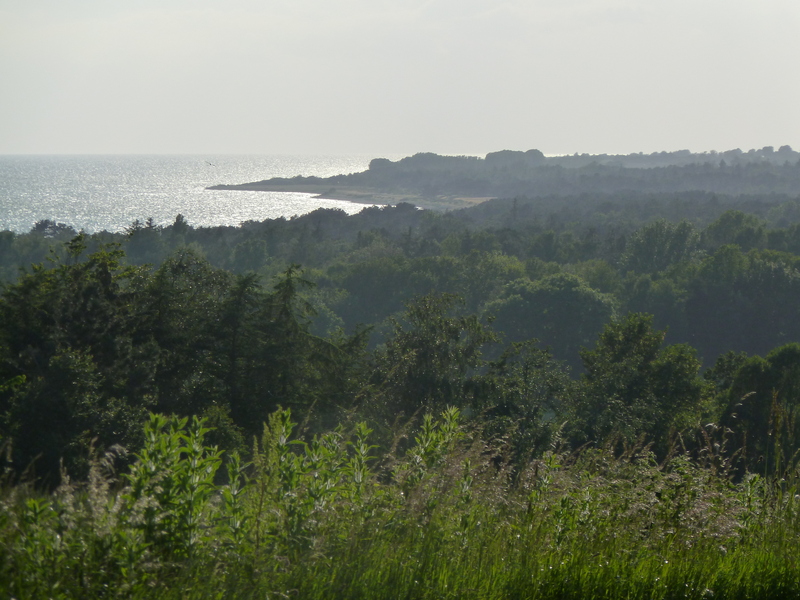 It’s 130 kilometers to Aarhus from Copenhagen—that’s about 80 miles. 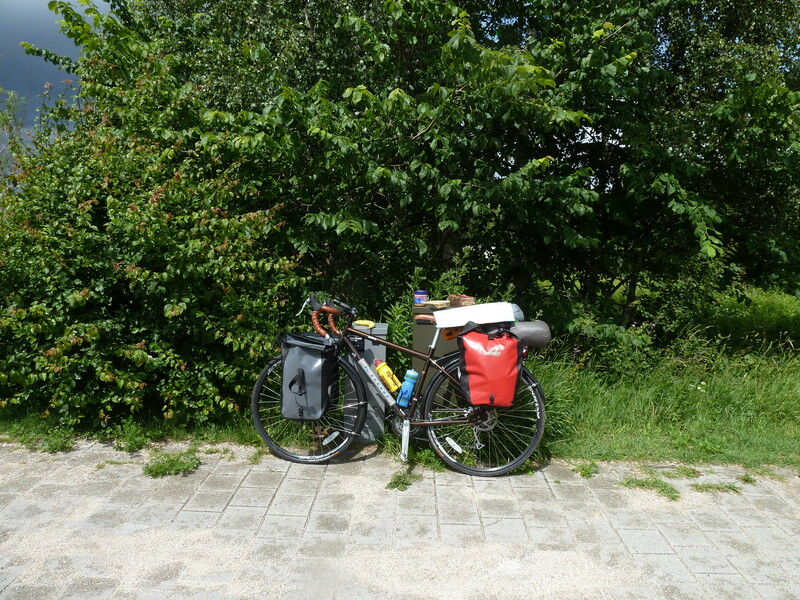 I loaded my bike up and was surprised by how well the bike still handled with the extra 40 pounds or so my four panniers added. My Kona--fondly known as Big Bertha--in full touing mode. I’d heard from a few people that the first day of a tour is always the worst day. Often people over pack or the weight in the panniers is unbalanced and can cause a fall. I didn’t feel burdened by the extra weight at all. I easily found my way out of Copenhagen and on to the rural cycle route I’d decided to take. About 40 kilometers into the ride I stopped to have a snack and was feeling very good. The sun was out, navigation was going well, my muscles felt fresh, and I was going through some beautiful countryside. At about kilometer 41 everything changed. The cycle route took me into a heavily forested area and the track turned into gravel. The route markers became less frequent and I began second-guessing if I was going the right way. The Danish Cycling Federation has over 11,000 kilometers of cycle routes in Denmark and so far the route I had been on was marked incredibly well. It seemed like there had been a sign every 5 minutes reassuring me that I was still on route 31. So after about 20 minutes of riding in the woods without seeing a marker I had a sinking feeling that I had lost the route somehow. I looked at the map and tried to figure out where I was and eventually just retraced my steps until I got back to the last marker at the entrance of the woods. The marker had an arrow clearly indicating that the route went into the woods. I didn’t know what to do. I needed to do something. I knew the general direction I needed to go and figured I would just get back on my bike and start going through the woods that way. 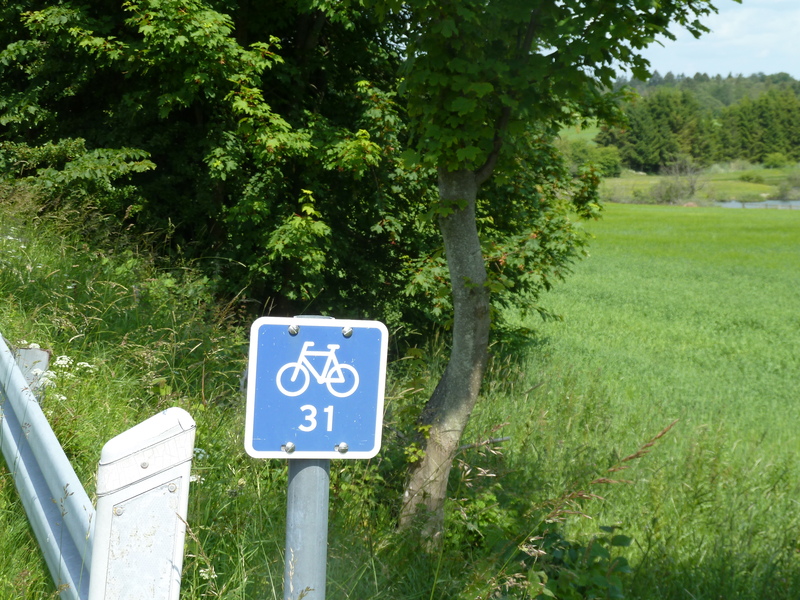 I eventually got out of the woods and on to a concrete cycle track and miraculously found another route 31 marker. I felt relieved until about 15 minutes later when the track turned to gravel again and the route markers disappeared. A Danish Cycling Federation route marker early on in the ride. The landscape was getting more and more rural and according to my map the track really slithered through farm and forest land for this stretch of the ride. I got on to a road and found another route marker after a few kilometers, but I had completely lost my faith in route 31 by then. I spent close to an hour going through the same cycle of losing the route, retracing my steps, trying another direction, and then finding the route again. I had lost my rhythm because I had been stopping and starting so much to look at the map, I hadn’t covered much distance, and I was starting to get tired. Then it started to torrentially downpour. 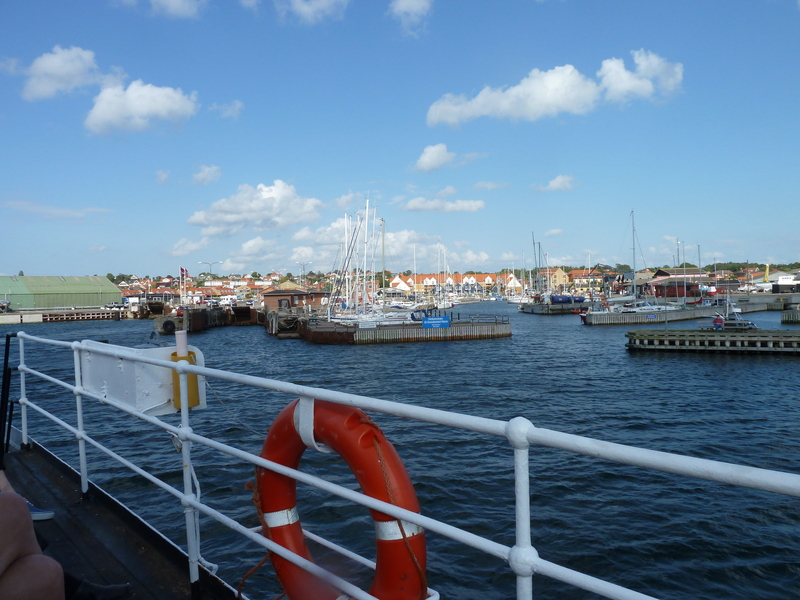 I still had about 50 kilometers to go and I also had to take two ferries to get to Aarhus. I sat under a tree while the rain came down and felt defeated. I started doubting myself and my whole plan to bike across Europe. Every adventure typically has a defining point when you decide how much discomfort you can handle and how much your goal really matters. You either recommit yourself to meeting your goal or you redefine your goal. The rain had actually refreshed me and I felt collected again. I decided that I was going to get to Aarhus that night. I got up and started biking through the rain until I got to a little town. Once I knew where I was I decided to give up completely on route 31 and figured out a new route that went along main roads. The main roads had more car traffic on them, but they were still scenic and most importantly I felt confident that I was going the right way. The rain stopped and I made it to the first ferry in pretty good time. View from the first ferry. I felt positive again. The last 30 kilometers of the ride was along a skinny stretch of land completely exposed to the northern winds coming off the ocean. The gusts of wind were powerful and unrelenting. My pace slowed considerably but I found a rhythm and stuck with it. The area was stunningly beautiful and I tried to focus on my surroundings rather than thinking about how much work I was doing to cover such a minimal amount of ground. I was heading for the end of the point. When I got to the second ferry landing I felt like I’d accomplished something impressive. I’d left Copenhagen 10 hours ago; it had been a long day. My good friend Stine (pronounced Sti-NA) met me at the ferry docks in Aarhus. Stine and I were close friends in middle school and high school. She is Danish and moved back to Denmark for college after we graduated from high school. It had been seven years since I’d last seen her, but we seemed to pick up right where we left off and quickly caught each other up on all that had happened over the years with school, our new careers, relationships, and family. 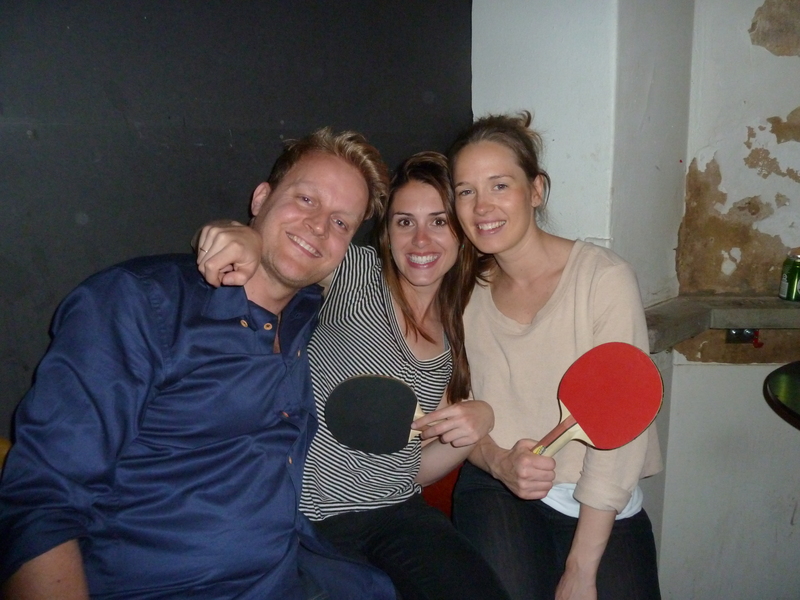 At a ping pong bar on Saturday night. Left to right: Peter (Stine's boyfriend), me, Stine. 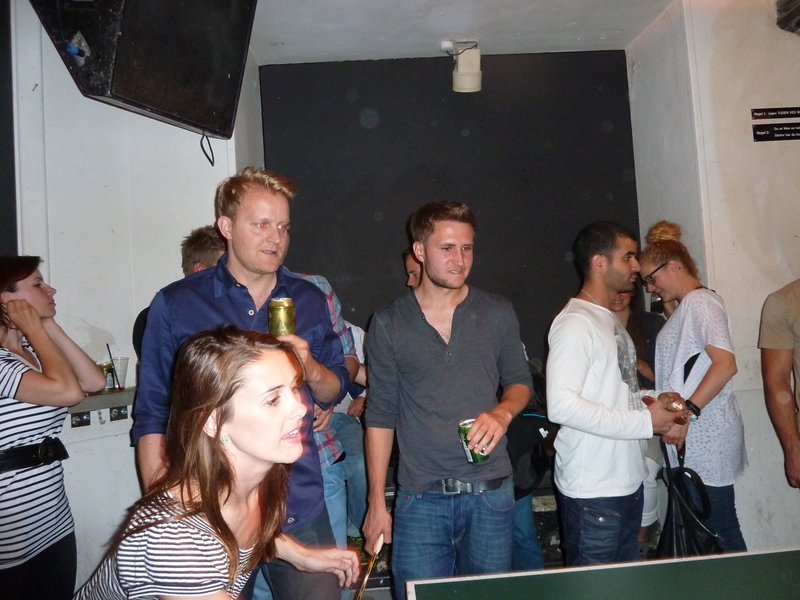 Peter teaching me to play ping pong Danish style. Peter also fixed my iPhone so I have a GPS now!! She now works for one of the largest advertising firms in Denmark; BoConcept—the Danish furniture company—is one of her biggest clients. We spent Saturday morning biking through Aarhus, frequently stopping in at different shops and markets to buy food, Danish candy, and other treats. Aarhus is much smaller than Copenhagen but it’s incredibly charming with cobblestone streets and a lot of leafy elegance. We were both getting tired by the middle of the day and it had started raining really hard. We went back to Stine’s apartment and she put together a very tasty meal of local produce, fresh bread, cheese, olives, and lots of other delicious things. Danish strawberries are some of the best I’ve ever had. We put sweatpants on and watched a chick flick while the rain came down outside. After the chick flick we drank some white wine and got out Stine’s old scrapbooks and yearbooks. We did a lot of reminiscing and laughing about high school. Stine told me about a Danish word—hygge—which has no direct English translation but is a big part of Danish culture. Hygge is best described as cozy and nice. She said it’s the feeling you have when you come into a warm house after being outside in the cold. Spending time with family and friends eating good food and drinking is hygge. Danes always have candles lit at home because it’s hygge. She told me that we were having a hygge day. I’ll be sad to leave Aarhus tomorrow and have felt so welcomed here by Stine. I’m glad we were able to share some warm and cozy moments together over the weekend. Stine and I both agreed that the Danes might enjoy cycling as much as they do because it offers a heightened sense of hygge. Cycling helps Danes soak up and enjoy all the light and warmth they can from the brief Danish summers. Good food and drink in a warm house with friends is especially appreciated after a cold winter bike ride. 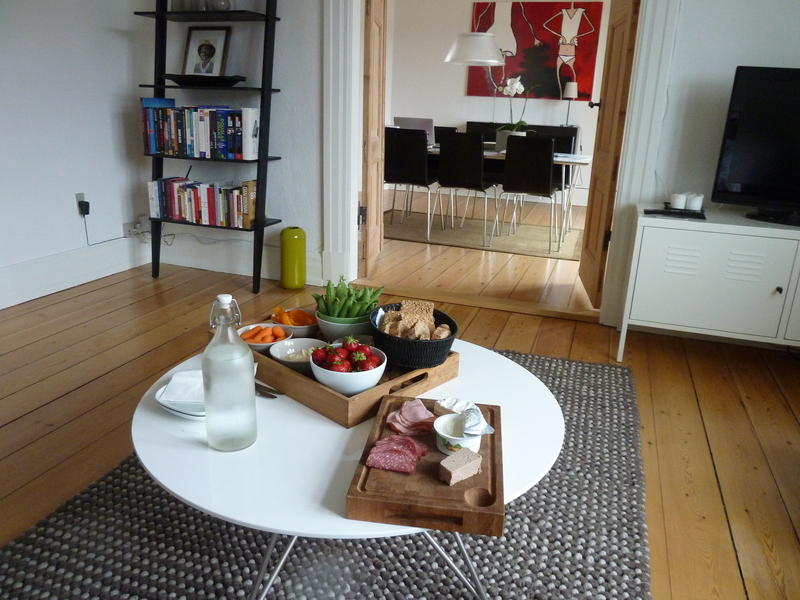 I know that after my long ride here I felt especially lucky to have a hygge-filled weekend with an old friend. I love reading your blog and we are all thinking of you and sending our love! We just received your postcard from Iceland: There Are Many Wonders in a Cow’s Head. I don’t get it!? I guess it’s a good thing I don’t live in Iceland. We had a lovely hygge weekend here in front of a cozy fire with friends while the rain poured outside. By the way, how do you pronounce “hygge”? As far as I can tell, hygge is pronounced “who-ga-lee”–it doesn’t sound at all like it is spelled. Hygge days are my favorite! 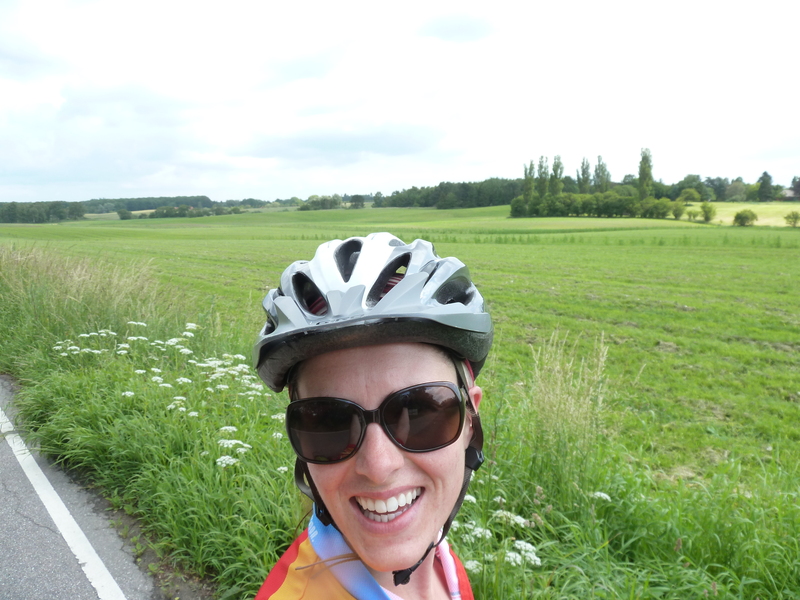 Lovin the posts and feeling inspired to cycle…. So glad you’re having a good time – Stine looks exactly as I remember her! Blog post request: Packing of the panniers. I am very curious as to how you’re toting your supplies along.